Game Show Mania brought back so many memories for me, from game night with my family to watching our favorite game shows on television. My mother would make popcorn on top of the stove and we would add the butter and salt. We were and still are a very close knit family. The spirit of family filled the air at Mariners’ Inn, I could see the bonds formed. I almost forgot about the mission and the circumstance that brought each guy there. 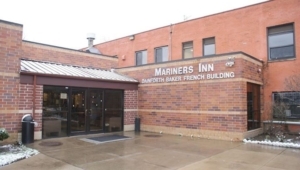 Mariners’ Inn serves as an anchor for those struggling to navigate the treacherous waters of homelessness and substance abuse through a wide range of social service programs that achieve the best possible outcomes for adults, families and youth affected by addiction. I will never forget the first time my older brother called me and confessed that Mariners’ Inn would be his home for the next 90 days or more. I knew he battled with addictions but I guess I never imagine he was at the point of needing serious help. As a family, we have all experience tragedies on so many levels, and we all have different ways to cope with them. He shared with me that through this program he was challenged to face his reality instead of hiding them in the deep pockets of his heart. He said the exposure and vulnerability was painful but necessary for his recovery. Looking at all of the men there, jumping at the chance to win during the Game Show Mania, I was encouraged to see them standing at a second chance to win at life. It’s amazing to know that our past is very much a part of our story, but it does not have to determine out outcome. Bad decisions, mistakes, and shortcomings are those factors in life that can leave us delicate but when we have the opportunity to surround ourselves with hope and a family to cheer us on to success, we then can find the power and strength to stand. I definitely left there feeling blessed to have experienced the Mariners’ Inn.